with wizened faces and chicken bone legs. their own deformed offspring in place of them. and then they are known to laugh wickedly. who were all fair of face and angelic. and brought it to the woods and left it there. my own sweet child back to me--my real child. That night there was a knock at the front door. There stood the Queen of the Faeries herself. She held the changeling screaming in her arms. 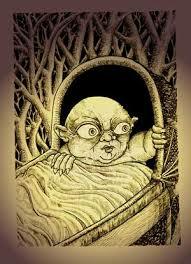 “but this baby is not of faerie-kind. Poet's Notes: Some children are born sociopaths, and there is little that can be done about it. This has been true since Eve gave birth to Cain.